The U.S. Census Bureau’s Bureau of Economic Analysis released trade deficit figures for December, which also means we can add up the totals for 2013. Our “oil boom” lowered the total, but goods and services got worse, with our China problem setting another record. The U.S. international goods and services trade deficit fell to $471.5 billion in 2013, from 2012’s $534.7 billion. This is an improvement of $63.2 billion, which is 11.8%. This was because the U.S. goods trade deficit in petroleum goods declined by $59.0 billion (20.2%) while the U.S. trade deficit in non-petroleum goods rose $20.7 billion (4.6%). But the non-petroleum goods trade deficit went up from $438.4 billion in 2012 to $456.4 billion in 2013. Meanwhile our goods trade deficit with China set a new record in 2013, up $3.3 billion from $315.1 billion in 2012 to $318.4 in 2013. This is the fourth year in a row with a record enormous, humongous deficit. The 2013 trade deficit was $471.5 billion. That means that we bought $471.5 billion more from outside the US than outside the US bought from us. That was $471.5 billion drained from our economy, our businesses, our wages, our taxes and our prosperity. Think about this: If companies making and doing things here inside the US had received orders for another $471.5 billion in goods and services, how do you think our economy would be doing? Imagine the factories and other businesses that would be opening, the suppliers that would be booming, the people being hired, the rise in wages, the tax revenue flowing into state and federal coffers… That is what a $471.5 trade deficit is. 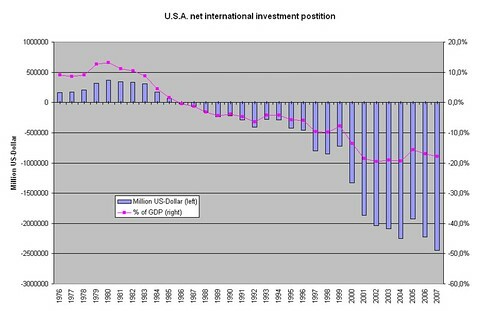 Do We Need More Trade Agreements That Cause Deficits? U.S. trade and investment deals such as NAFTA, KORUS and China’s membership in the WTO have resulted in growing U.S. trade deficits and job losses and downward pressure on US wages. This is not the time for massive trade deals that cost jobs and depress wages. The United States should stop negotiating new trade deals such as the TPP, and fix the ones we have. Click through to see the other effects the Reagan Revolution has had on our economy and society.